What happened to Sydney’s Bus Future? Why are the NWRL tunnels too small? Questions about the decision to build the tunnels for the North West Rail Link (NWRL) too narrow and too steep for existing Cityrail rolling stock have resurfaced as the government signs the tunnel boring contract for them. Transport Minister Gladys Berejiklian had already admitted that any savings from narrower tunnels on the NWRL would be outweighed by the costs of retrofitting the existing Epping to Chatswood Line, but it now appears likely that one of the bidders for this contract had offered to bore the tunnels at the larger diametre for the same price. Mr MICHAEL DALEY: My question is directed to the Minister for Transport. Given the budget appears to confirm that the North West Rail Link will be nothing more than a privatised shuttle service, has the Minister received any advice that the tunnels for the North West Rail Link could be bored to a width that would accommodate double-deck trains at no additional cost to the project? Ms GLADYS BEREJIKLIAN: Members of the New South Wales Labor Party should hang their heads in shame in relation to the North West Rail Link. Mr Richard Amery: We’ll have to, to get through the tunnel. The logical conclusion from this is that the government’s decision to proceed with narrower tunnels is not due to financial considerations. Instead, it is to guarantee that the NWRL remains a segregated, privately operated system that does not interact with the existing Cityrail network. This is the dominant vision of the transport planners at Transport for NSW, and has been ever since 2008 when they convinced the state government to build a completely segregated metro line from the CBD to Rouse Hill (since abandoned and replaced with a cheaper option that also uses portions of the existing network rather than building completely from scratch). This would prevent the new line from being operated by Railcorp, an organisation that is seen by these planners as slow, inefficient, expensive, and lacking a user (i.e. passengers) focus. Ms Berejiklian often cites that it costs $10m per day to operate, about the same as the London Underground but with about a quarter of the patronage. She is therefore leading a structural reform of Railcorp, with the creation of Sydney Trains and NSW TrainLink, but simultaneously also pursuing the option of a completely new line operated by “anyone but Railcorp”. The decision to make the tunnels narrower and steeper guarantees the independence of this new line, ensuring that the private operator can be held entirely accountable without being able to blame the government rail operator (e.g. because a delay on Sydney Trains prevented the private operator from running on time), while also neutering union opposition to advancements like driverless trains. It is the poison pill that prevents any future government from having a change of heart and integrating the NWRL into the rest of the Cityrail network. Their fear is that a future government could do this in order to, for example, once again scrap the construction of a Second Harbour Rail Crossing, a project announced and subsequently abandoned so many times that transport planners may have found a way of ensuring it gets built – by holding another line hostage in the process. Nor would wider tunnels necessarily be some silver bullet, the tunnels would still be too steep for existing rolling stock. And it’s worth remembering that any future tunnels under the Harbour (the government is planning its Harbour Rail Crossing to be an under the Harbour tunnel) may also have to be quite steep and the existing tunnels between Epping and Chatswood are already too steep for some existing rolling stock, resulting in new rolling stock like the Waratah trains being built to be compatible with the steeper gradient. Similarly, there are few technical barriers to prevent future double deck rolling stock designed to navigate the narrower and steeper tunnels on the NWRL. But it will prevent that from happening long enough to see whether private operation of heavy rail results in better outcomes, and should be expanded; or is a repeat failure like the privately owned Airport Line, and should not be repeated. Correction: It’s been pointed out that Tangaras, although not initially used in the Epping to Chatswood tunnels due to their steepness, now are used in them. This is confirmed by the proposed October 2013 timetable. In other words, rolling stock that was not initially able to be used on the Epping to Chatswood tunnels were later able to be used in those tunnels. This is consistent with restrictions on existing rolling stock on the NWRL tunnels, where future changes could also allow double deck trains to still be used on them. What factors encourage public transport use? This post was inspired by the recent EcoTransit video posted above. In it, the claim is made that 90% of trips into the CBD from the South West are by public transport, while 90% of trips to South Sydney and the UNSW/Prince of Wales Hospital area are by car. No source was provided for these figures, although a 2008 government report entitled Employment and Commuting in Sydney’s Centres, 1996 – 2006 does provide data for Sydney as a whole and is the basis of this post. Notes: Car journeys include both drivers and passengers. The majority of the balance of journeys were made by public transport, with walking and cycling generally not exceeding 5%-10%. All figures refer to journeys to work only and come from 2006 census data. As a general rule of thumb, the centres tend to have both a higher employment density plus a lower share of journeys to work made by car, and these two are negatively correlated (i.e. if one is higher, the other tends to be lower). At the top of the list is the Sydney CBD, with an employment density of 546.4 jobs/Ha and share of journeys by car of 19.5%. This compares to the figures for the non-centre areas of Sydney (“remainder”), with an employment density of 0.8 jobs/Ha and share of journeys by car of 85.2%. They are relatively old (7 years). This means, for example, they pre-date the 2009 opening of the Epping to Chatswood Rail Link. They only include journeys to work (as this is the question asked on the census). Journeys to schools, universities, TAFE, etc are not included, even though they tend to occur at similar times as the morning commute, nor are journeys for recreation, shopping, etc. They don’t indicate what level of parking restrictions (for both on and off-street parking) have been put in place. Limiting the amount of available parking (particularly free and abundant parking) leads to a significant decrease in driving to work. The case of limited parking vs increased employment densities is a bit of a chicken and egg argument over which causes the other. It’s assumed here that they go hand in hand, and therefore employment density can be used as a proxy for parking limits. They don’t show which specific mode of transport was used (e.g. driver vs passenger or train vs bus vs walk). These figures are available in the original source document, but have been aggregated for simplicity. Looking at the data in a more visual form, patterns become quickly evident. Here the mode share of trips by car is shown on the y-axis, the employment density is on the x-axis, and the size of each bubble indicates the size of each centre by employment. Bubbles are colour coded by centre type the same way as in the table above. The link between employment density and driving to work is quite clear – the higher the employment density, the less likely workers are to drive to work. The correlation is strongest up to an employment density of around 150. Above this, higher employment densities do not seen to result in lower car usage, with the Sydney CBD (the large blue bubble on the far right), being a bit of an outlier. However, that is based on a fairly small sample size of 4 centres, whereas there are 29 centres under the 150 jobs/Ha threshold. Proximity to the Sydney CBD also seems to result in lower car mode shares, evident by the non-CBD Sydney Central centres and the City Education/Health Precinct (the 3 blue and one green bubble on the bottom left) all having a lower car mode share than other centres with similar employment densities. Removing these 4 centres gives a much cleaner correlation, where going above the 150 jobs/Ha threshold still reduces car mode share, but at a lower rate. Education precincts also have lower car mode shares. The City and Randwick Education/Health Precincts (the two green bubbles in the bottom left) both have lower car mode shares than other centres with similar employment densities. This is more pronounced for the former, given its proximity to the CBD, but can still be clearly seen for the latter. Business parks, on the other hand, tend to have higher car mode shares. Norwest Business Park and Macquarie Park (the 2 red bubbles at the top), both have much higher car mode shares than other centres with similar employment densities. Olympic Park and Rhodes also have higher car mode shares than similar centres. This may suggest that it is their lack of good rail connections that encourage their workers to drive. The former 2 had no rail connections in 2006, while the latter 2 had only limited rail connections. But support for this in the data is mixed, given that North Sydney and Chatswood (the two red bubbles on the right) both enjoy excellent rail connections, but still display a greater tendency for its workers to drive. 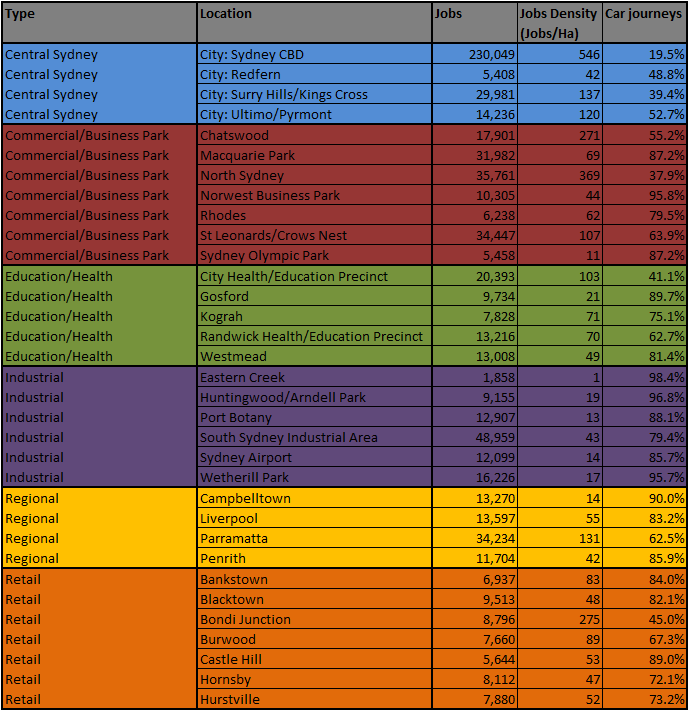 In the case of North Sydney (the red bubble on the right), it has a much higher employment density than Surry Hills/Kings Cross (the lowest blue bubble on the left) does (369 jobs/Ha and 137 jobs/Ha respectively). Yet both have similar car mode shares (39.4% and 37.9% respectively) and are both in close proximity to the CBD. In addition, the Randwick Education/Health Precinct (the green bubble second from the bottom) has no rail connection and achieves a similar car mode share to St Leonards/Crows Nest (the red bubble third from the right) which does have a rail connection. This is despite the former having a lower employment density to the latter (70 jobs/Ha and 107 jobs/Ha respectively). This suggests that the type of public transport available does not impact its mode share significantly. Instead, it’s the quality of that transport, things like speed and frequency, that determine its use. So somewhere like Rhodes, which has relatively infrequent and slow trains on the Northern Line, is not as well services as the Randwick Education/Health Precinct, with its frequent express buses that come in from Central and the CBD via bus only lanes. Higher employment densities are correlated with lower car use in journeys to work, particularly for densities up to 150 jobs/Ha. Proximity of employment to the CBD enhances this correlation. Meanwhile, workers at universities are less likely to drive, while workers at business parks are more likely to drive. The availability of frequent and fast public transport encourages a modal shift to public transport, the mere existence of a rail connection does not. Paul Mees’ 2010 book Transport for Suburbia discusses the issue of population density and whether a high population density is required to achieve high public transport usage. He argues that it is not, and that a low density city can still achieve high public transport usage. Post Script: Paul Mees sadly passed away earlier this week on Wednesday, before this post was published, but after the above paragraph was written. He was a public transport advocate, heading the Melbourne based Public Transport Users Association for a decade, as well as an academic at both Melbourne University and RMIT. Chris Loader at Charting Transport looked into this further for cities from various countries, then in more detail on Australian cities, and finally into great detail on just Sydney. Two maps looking at employment density and public transport use in Sydney most relevant to this from the final link are included below. 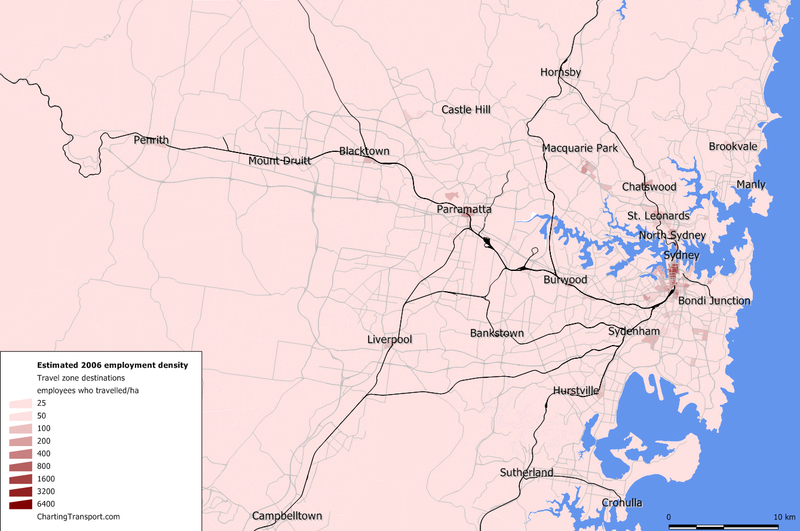 An earlier post on the WestConnex looked at whether it should link up to the CBD, and what sort of trips car travel is best suited to compared to what sort of trips public transport is best suited to. 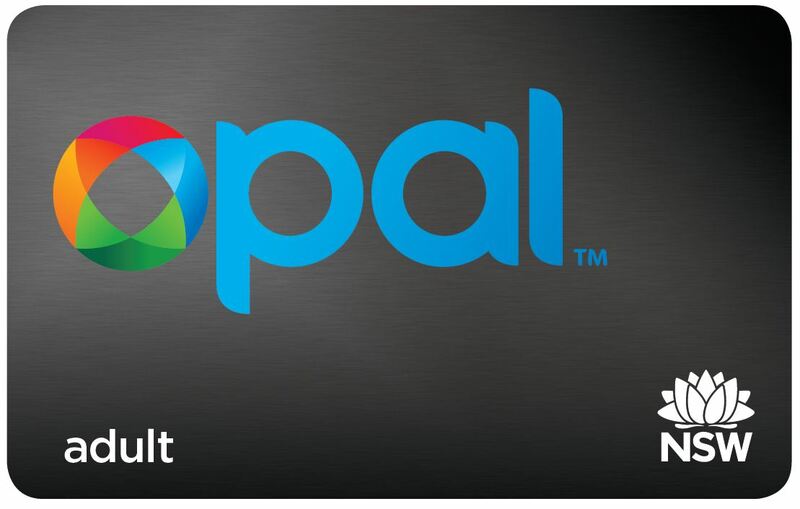 Should the Opal trial include fare integration? A quick follow-up to yesterday’s post about integrated fares, looking at both case for and the case against rolling out integrated fares at the same time as integrated ticketing (Opal). First, the case for, by developer Stephen Mok, who argues that a trial is not a true trial if it does not also test the removal of intermodal transfer penalties. 1) I’m surprised that intermodal transfers are not part of the trial. I would’ve thought that IS part of making sure the technology works – surely the integration between transfers with timing, default fares, etc needs to be tested too? And if it’s going to be tested, I would’ve guessed ferry/train would be an easier starting point, before buses are involved. And the case against, by engineer Perry Stephenson, who argues that adding complexities early on increases the chance of failure from both an engineering and political perspective. “If you’re a clever engineer, looking at the roll-out like a clever engineer would and identifying the risk that by attempting to integrate fares as well as roll out a swipe-card system simultaneously, you’re likely to hit some fairly complex problems along the way and likely end up failing like the T-Card did. Instead, if you focus on the technical issues surrounding a swipe-card roll-out, complete the roll-out quickly and within budget and get 12 months of operations for troubleshooting post-launch, you’re in a much better place to focus entirely on the integration of fares using your new, stable, real-world tested ticketing platform. Also you’ll have 12 months of adoption by the public and hopefully high numbers of users. In other news, Charting Transport has a new post up about multimodal trips in different Australian cities, which is quite relevant to this topic. A must for anyone who loves lots of graphs! Sydney still lacks true integrated fares. In Melbourne, a single ticket allows you 2 hours of unlimited travel within a certain zone. You then decide how to get from your origin to your destination, what sort of vehicle or combination of vehicles. In Sydney, passengers are generally penalised financially if they transfer from one vehicle to another (unless it is from a train to another train). Someone travelling from Enmore to Circular Quay would be better off changing at Newtown for a train (as would the network as a whole as it would allow the removal of buses from the CBD), but doing so requires paying for an additional train ticket or upgrading to a more expensive myMulti ticket and so virtually all stay on the bus the whole way. One possible solution, possible now that the Opal smartcard is being rolled out, is to charge passengers based on the total distance of their journey (point to point fares). It wouldn’t matter which, how many, or what combination of vehicles was used, the fare would remain the same. Alternatively, the existing zonal system used for myMulti tickets could be retained (zonal fares), but set at the same price for single or multimodal journeys. To do so for either the point to point or zonal methods means changing the relative fares of single mode and multimodal tickets. This is a relative change, so it could be an increase in the former, a decrease in the latter, or a combination of both. Further cuts in fares is difficult, due to a falling farebox recovery ratio (explained below using the example of Cityrail). IPART sets fares so that farebox recovery (what passengers contribute in fares) is roughly 28% of Cityrail’s efficient operating cost, but none of the capital cost. So things like the North West Rail Link, South West Rail Link, and new Waratah trains are paid for entirely by the government, but things like staff salaries or electricity to run the trains are partly paid for by ticket sales and a government subsidy. The efficient costs refers to the total operating costs less any non-fare revenue (government concessions, rental income, etc) received. This 28% target has not been met in recent years. It was 27% in 2008/09, falling to 25% in 20011/12 (Source: Review of maximum fares for CityRail services from January 2013, IPART Nov 2012, page 13). There were a number of reasons for the drop. The introduction of myZone in 2010 saw a number of fares cut, but almost none increased. No fare increased was made for 2011, though the following year’s increase was a double up to make up for that. The current government has promised no fare increases above CPI without any improvements in services, and has stuck to the CPI limit since 2011. Also in 2011, an additional discount of 9% was provided on periodicals (monthly/quarterly/yearly tickets). More recently, the government effectively increased fares for ferries by removing them all from Zone 1 and some from Zone 2 in the myZone system, forcing myMulti users up to a myMulti2 or myMulti3 if they wanted a multimodal ticket. The current Opal fare system also does not include periodicals, which if retained could increase fares for some by hundreds of dollars a year. However, most fares will remain cheaper under Opal than under the the current magnetic stripe tickets, particularly for off peak users. So if cutting fares further is difficult, assuming a limited transport budget that is not increased, then the government would have to increase fares in order to achieve integrated fares. Recent reports suggest that this is not the government’s priority, and that there remains a preference for charging different fares for different modes due to the varying cost structures of different modes. Some minor improvements have been made – such as integrated fares for a single mode (e.g. ferry to ferry, or train to train while temporarily exiting the station), or the daily $15 cap and weekly free travel after the first 8 trips. This might be enough for now, but will create problems come 2019 and 2020 when the North West Rail Link and South East Light Rail Line are opened. These two projects will in part rely on feeder buses and passengers transferring to second mode of transport in order to reach their final destination. This integrated network approach is a more efficient one, allowing a higher capacity of passenger movements along a central spine using rail based transport. But it needs integrated fares to be truly successful. The danger remains that Sydney will get integrated ticketing and an integrated network, but no integrated fares. North West Rail Link – policy or politics? Video: The Not Zach Braff $2mil Global Short Film Project. For more details, check out You’ve Never Heard of Me. The North West Rail Link (NWRL) as currently planned, will require many passengers to get out and change trains at Chatswood. Based on government estimates, two thirds of passengers from The Hills in Sydney’s North West would have to do this in order to reach their final destination on the Lower North Shore or CBD. This would continue until a Second Harbour Rail Crossing is built, something which currently lacks a start date, end date, or funding. One alternative would be to build additional capacity through the CBD first, and then extend that capacity into the outer suburbs second. In other words, build the Second Harbour Rail Crossing now, and the NWRL and South West Rail Links some time next decade. From a purely engineering perspective, this makes perfect sense – there’s no point in building new lines in the outer suburbs, if all they are going to do is dump passengers in the inner city once they reach a bottleneck. Melbourne is doing exactly this. It’s current proposal is the Melbourne Metro, a new underground line through the CBD. And it is building this despite calls to build lines to places like the airport or to Doncaster (the latter has similar transport challenges to Sydney’s North West). Not only that, but this has put the Melbourne Metro at the top of Infrastructure Australia’s priority list, resulting in the Federal Government committing $3bn in funding to its overall $9bn cost. A strong case can be made that the Victorian Government has got the policy right, while the NSW Government has not. But what could be argued is that the NSW Government has got the politics right. This is for a number of reasons. Building a Second Harbour Rail Crossing will not guarantee that the NWRL will be built, but building the NWRL will force a future government to build a Second Harbour Rail Crossing. In a world where political realities make long term planning a dream rather than a reality, and where transport projects are announced, cancelled, changed, re-announced, and then cancelled again, this is not necessarily a bad thing. The narrower and steeper tunnels, which force the new line into being run completely independently from the rest of the network, will also allow the government to trial new methods of service delivery, such as franchising or driverless operations on trains. The former has allowed for Sydneys bus network to see improvements to services, lower fares paid by passengers, and reductions in operating subsidy paid by the government to provide them. The latter would reduce the marginal cost of each train service, allowing the government to increase services without as large an increase in operating costs. Neither of these could work effectively if the NWRL was integrated into the rest of the network. These sorts of changes are possible on an existing line, and the Eastern Suburbs & Illawarra Line has often been touted due to it operating virtually independently from the rest of the network. But it is much harder to convert an existing line compared to a new one. Unions are likely to resist change, and existing passengers may have fears of the unknown. Both of these fears would be eased by seeing such changes in operation first, and if they work then they can be rolled out to the rest of the network. Of course, for those who consider a Second Harbour Rail Crossing an expensive and unecessary expense, then there is little reason to support what the government is doing. The same goes for those who oppose one man or driverless operation. For everyone else, while this may not be smart policy, it certainly looks like smart politics. I had the chance to see Vivid on Saturday night. I found it interesting, but it was far too crowded for my liking. Still, it’s great to see cultural events in Sydney that bring so many people in. Such events are what make Sydney such a vibrant place to live in and what makes so many people want to come here. The problem caused by large numbers is the transport problems that it creates. It was pretty bad on Saturday night when I went – George St was closed Northbound past Wynyard and we had to get out of our bus early and walk the rest of the way. But it was even worse the following night on Sunday. But crowds had an impact even before the final weekend. It affected me almost 2 weeks ago when I was trying to catch a bus home from Fox Studios, as numerous buses went by full without picking anyone up. It reached the point where some people waiting at the bus stop gave up and walked off before a bus let us on. 22 minutes later and the 4th bus let us on! It soon became clear that Vivid was causing peak hour like crowds in the CBD, but without peak hour capacity. This is not the only time when big crowds converge into the CBD and then try to get home, it happens twice a day in the morning and evening peak hours as well as during the New Year’s celebrations, but generally handled well in each of those cases. Given the quantity of people, public transport is the best way to move them. But in this case, there doesn’t seem to be enough capacity to keep up with demand (as well as other occasions – the Christmas party season comes to mind, particularly given the alcohol consumption that forces people into either public transport or a taxi in most cases). Demand for public transport is a good thing, but only if it is met with sufficient supply. This was the problem faced in Melbourne a decade ago, and this is how the PTUA, their public transport advocacy group, was instrumental in fixing the problem of insufficient public transport. 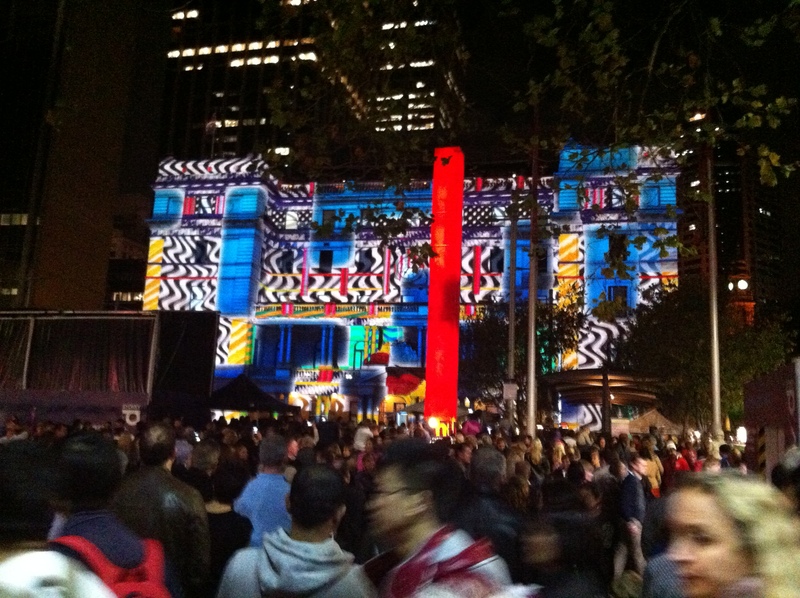 Hopefully we can achieve something similar here in Sydney for major events like Vivid. Update (7:59PM, 10 June 2013) – There were some additional bus and ferry services timetabled for Friday and Saturday nights, though no additional trains nor anything for the Sunday of this long weekend that just passed. Roads Minister Duncan Gay has reportedly told 2UE that “We’ve now got effective New Year’s Eve [crowds] and frankly we need to treat it that way”. NSW Transport Minister Gladys Berejiklian confirmed earlier today that the North West Rail Link will have driverless trains. 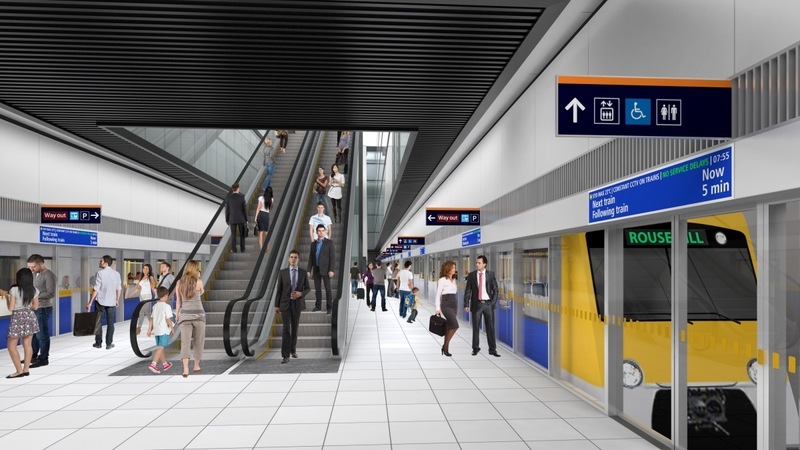 The new line will be run independently from the rest of the network by a private operator, featuring screen doors and completely automated rolling stock. Driverless trains are a massive game changer, and have many potential benefits. The most significant is the reduced marginal cost of operating an additional train service. It’s the marginal costs that matter, because it indicates the cost of providing an additional train or savings from cutting one. With lower marginal costs, a much lower level of patronage is needed to maintain a reasonable level of cost recovery via fares. Anecdotal evidence from Vancouver’s Sky Train driverless network (where you never have to wait more than 8 minutes for the next train, even late at night) shows that driverless trains there resulted in marginal cost of $11 per hour. But there a also reliability and safety benefits. An automated train never calls in sick, or turns up to work late. Meanwhile, human error was responsible for both the Waterfall and Glenbrook disasters, both of which resulted in fatalities. The transport union has decided to oppose this move, which is unfortunate. Their suggestions that driverless trains will be less safe flies in the face of the Waterfall and Glenbrook examples previously mentioned. It also overlooks the fact that modern aircraft run on autopilot all the time, despite being massive flying machines, where there are many more chances for something to go wrong than a train on a fixed guideway. They probably also fear job losses, but the benefit of driverless trains means that limited resources can be better allocated, to have more station staff or more staff roving trains (something which neither drivers nor guards on trains currently do). Other concerns have been raised. Advocacy group Action for Public Transport raises the issue of assisting passengers on a train that breaks down between stations on the NWRL, which can be up to 6km apart. If trains on Sydney's north west rail link are driverless, who will help evacuate stalled trains? Underground stations are up to 6km apart. Shadow Transport Minister Penny Sharpe suggests that this represents a broken promise, given that the government had previously said it had no plans to introduce driverless trains. That criticism boils down to how much you consider weasel words to be a broken promise. Ultimately the decision to go with driverless trains is a good one. It will benefit passengers, and has been proven to work well in many other cities around the world.